Spray 5-quart slow cooker with cooking spray. Rub beef with salt. In 12-inch skillet, melt butter over medium-high heat. Cook beef in butter 3 to 5 minutes on each side or until browned. Transfer beef to slow cooker. In large bowl, mix tomatoes, honey, harissa, ras el hanout and cinnamon. Stir in carrots, onion, dates and garlic. Pour mixture over beef in slow cooker. Cover; cook on Low heat setting 7 to 9 hours or until beef is tender. Carefully transfer beef to cutting board; let stand about 5 minutes or until cool enough to handle. Shred beef, discarding any pieces of fat and cartilage. Stir into sauce in slow cooker. Meanwhile, make couscous as directed on package (do not add salt or butter). Serve beef mixture over couscous. Top with cilantro and feta cheese. Ras el hanout is a North African seasoning blend that includes warming spices like cinnamon, nutmeg and clove alongside stimulating ginger, pepper and chili. This flavorful seasoning is often called “Moroccan spice blend” and can be found in most grocery stores. We used regular unseasoned couscous (without butter or salt) to soak up the flavors of this highly seasoned braise. Moroccan flavors are all the rage these days and for good reason, too. Tagine is an especially well-known North African concept, but it actually has two meanings. Tagine is a type of North African cookware that’s made of either clay or ceramic. The dish is used for as a cooking vessel and a serving vessel. Alternatively, tagine refers to the stew that’s slow cooked in the vessel. Traditional tagine is a rich and thick stew that’s made of a type of meat and vegetables. 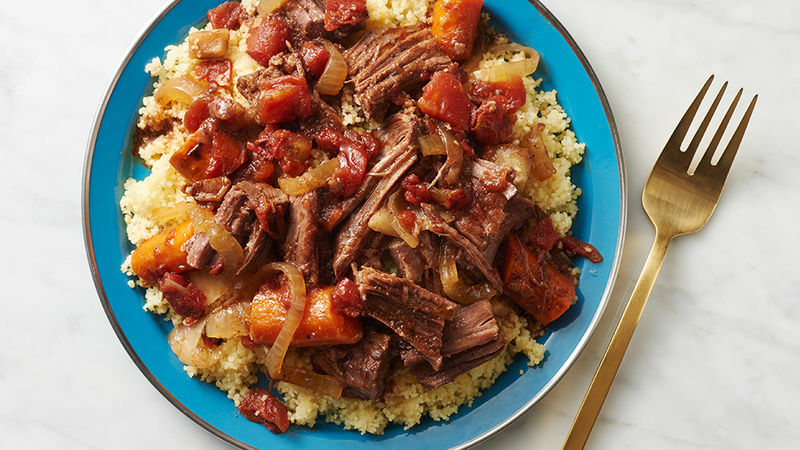 Beef tagine is sometimes called Moroccan stew; our recipe is an easier version of beef tagine and doesn’t require a trip to Africa to acquire an authentic ceramic vessel. Instead the slow cooker comes to the rescue and delivers a authentic(ish) global experience. It’s perfect for Sunday dinner. As for the rest of the days of the week, here are more beef dinners for hectic weeknights.